By Kori ~ November 2nd, 2010. Since we live in Washington State and often drink wines from Washington State, we want to make sure that we continue to hone our knowledge of the entire world of wine and maintain well-rounded palates in order to make us even more objective when we evaluate wines from Washington State. Therefore, we are thoroughly enjoying our Wine Peeps Tasting Group which includes what we think is an excellent peer group of knowledgeable wine lovers to taste, share, and learn more about wine together. Unlike our monthly wine tasting dinners in which the guests rotate, this tasting group includes people who are committed to getting together once a month which we believe benefits all of us. In addition to trying varieties and regions that we do not taste frequently, the other main difference between this group and our wine tasting dinners is that each group member brings a bottle consistent with the monthâ€™s theme so no one knows all the wines in the blind tasting. Last week, we met and explored MourvÃ¨dre. Unlike our previous tasting group meetings, which have focused on a particular varietal from a specific region, this tasting simply focused on the varietal and each group member was free to bring a bottle of MourvÃ¨dre from any region in the world. The only requirement was that it was either varietally-labeled as MourvÃ¨dre (or a MourvÃ¨dre synonym such as Mataro or Monastrell) or, for countries that do not varietally-label, it must contain at least 75% MourvÃ¨dre. MourvÃ¨dre is a late-ripening variety that often produces tannic, high alcohol wines that are characterized by aromas and flavors of game, earth, and red fruits. It is often used as a blending grape in Rhone-style wines, frequently with Grenache and Syrah. We tasted nine bottles of MourvÃ¨dre from around the world, and the consensus favorite was the 2008 Rasa Vineyards Vox Populi MourvÃ¨dre from Washington State. I was glad to see this wine do well in the blind tasting because I had been particularly impressed with it on our recent visit to Rasa Vineyards in Walla Walla. The MourvÃ¨dre that goes into Rasaâ€™s Vox Populi was originally sourced to be a blending grape in their QED (a Syrah/Grenache/MourvÃ¨dre blend). However, when some of their winemaker friends tasted barrel samples of it, they commented on how remarkable it was. Even some collectors who tasted it offered to buy it in futures and asked them to bottle at least some of it by itself. Therefore, Vox Populi or â€œvoice of the peopleâ€ was born. Of the nine wines we tasted, three were from France, two were from Spain, one was from Australia, and three were from Washington State. 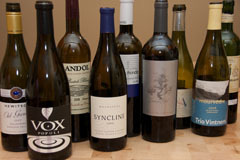 I was especially excited to see how favorably the Washington wines performed against peers from around the world. The three wines from Washington State finished first, second, and fourth in the group consensus rankings. 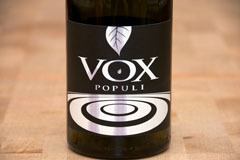 2008 Rasa Vineyards Vox Populi MourvÃ¨dre (Minick Vineyard, Yakima Valley, Washington): 100% MourvÃ¨dre. Deep, purplish ruby red. Gorgeous nose with red and black fruits, plum, raspberry, smoked meats, game, spice and white pepper on both the nose and palate. Medium to full-bodied with crisp acidity, medium to high drying tannins and a long finish. Big yet smooth and well-balanced. 2006 Syncline MourvÃ¨dre (Coyote Canyon Vineyard, Horse Heaven Hills, Washington): 100% MourvÃ¨dre. Deep, dark purplish red in color. Very aromatic with red fruits and spice on the nose. Game, earth, smoked meats, red fruits, and a hint of spice come through on the palate. Medium to full-bodied with very crisp acidity and medium to high, drying tannins. Well-balanced with a long finish. 2008 Juan Gil Monastrell (Jumilla, Spain): 100% Monastrell. Deep, ruby red. Very aromatic with dusty, smoky, and black pepper aromas that lead to chalky flavors, ripe red fruits, meat, and a hint of coffee. Medium to full-bodied with crisp acidity, medium to high, drying tannins and a long finish. 2006 Trio Vintners MourvÃ¨dre (den Hoed Vineyard, Yakima Valley, Washington): 96% MourvÃ¨dre, 4% Syrah. Deep, dark purplish red. Nice nose with cinnamon, spice, and perfume on the nose. Game, ripe red fruits, and smoke come through on the palate. Medium to full-bodied with lively acidity, medium to high, drying tannins, and a long finish. 2007 Hewitson â€œOld Gardenâ€ MourvÃ¨dre (Barossa Valley, Australia): Deep, ruby red. Aromatic with dirt, earth, and red fruits on the nose; earth and ripe red fruits on the palate. Medium-bodied with crisp acidity, medium tannins, and a long finish. 2006 La Bastide Blanche Bandol CuvÃ©e Estagnol (Bandol, Provence, France): Deep, dark ruby red. Peppermint, dirt, and earth on the nose lead to more earth and barnyard notes on the palate. Medium-bodied and lively with medium to high, slightly bitter, tannins, and a long finish. 2007 ViÃ±a Honda Monastrell (Jumilla, Spain): 100% Monastrell. Deep, ruby red in color. Nose is a bit tight at first, and then cardboard, oak, and cracked black pepper come through. Grapefruit rind, red plum, and chalky notes on the palate. Medium to full-bodied and tart with medium, drying tannins, and a long, somewhat bitter, finish. Very different profile than the others in the tasting. 2008 Domaine Astruc dA MourvÃ¨dre (Vins de Pays du Languedoc, France): Deep, dark purplish red. Smoke, red fruits, game, and earth come through on both the nose and palate. Medium to full-bodied with crisp acidity, medium to high, drying tannins, and a long finish. 2005 Chateau Pibarnon Bandol (Bandol, Provence, France): 90% Mourvedre. Deep, ruby red. Stinky cheese, expired milk, dirty diapers, and barnyard aromas lead to stinky cheese and rotten eggs on the palate. Medium to full-bodied with crisp acidity, medium to high, drying tannins, and a long finish. The aromas and flavors are not pleasant. Not sure if itâ€™s just a flavor profile we donâ€™t like or whether this bottle actually had a problem. I really enjoy MourvÃ¨dre and am certain that your tasting would have been a lot of fun. I do wonder about why you ended up rating and scoring the wines if the purpose of the tasting was to keep familiar with wines in this variety from the world. I cannot really understand what the first has to do with the second. Yes, this tasting was a lot of fun. Wine ratings are a controversial subject, but we believe that ratings are necessary. We believe that they give our readers a point of reference and may help them identify wines they would like to try. And also, we find them helpful in our own record keeping and database of wines we’ve tasted to see how these wines compared to other Mourvedre wines we’ve had in the past. Cheers! I would say that Chat de Pibarnon must have been a bad bottle. Dirty diapers and expired milk not so good. But what’s wrong with Stinky cheese and barnyard aromas. I tend to find wines from Bandol to have that sort of – Saddle leather and most pleasing to my taste. Piacere mucho : – )) and their rose’ ain’t bad either, but that’s a different subject. You may be right. As I wrote in the post, the Chateau Pibarnon Bandol was the consensus last place for our group. Since I have not had a lot of Bandol, I wasn’t certain whether some of the flavor profile was characteristic of the area or not. Yes, dirty diapers and expired milk is not so good. By themselves, stinky cheese and barnyard aromas are not necessarily bad but together with the other unpleasant aromas and flavors, I did not feel that this particular bottle deserved more than 2 stars. Cheers!